The U.S. PTO recently granted a patent for a new RNA interference nanotechnology, called packaging RNA or pRNA, to Kylin Therapeutics. The company, founded in 2007, is developing the pRNA platform to deliver RNA-based nanoparticles to silence genes that cause disease. “Our intellectual property is unique in the field of small RNA interference,” says Eric Davis, president, CEO, and co-founder of the company. Peixuan Guo, Ph.D., invented the pRNA nanotechnology while he was a professor of molecular virology and biomedical engineering at Purdue University. Dr. Guo, a co-founder of Kylin, now directs the Nanomedicine Bionanotechnology Center at the University of Cincinnati. The pRNA technology was modeled on the design of a molecular motor found in the phi29 bacteriophage. Individual subunits of pure RNA that self-assemble into dimers, trimers, and hexamers make up pRNA. A single pRNA dimer is about 25 nanometers. Promising RNA therapeutics such as aptamers, ribozymes, and therapeutic RNAs can be incorporated into individual subunits of pRNA. RNA interference is a natural gene-silencing process within all cells. The pRNA method exploits this process by selectively turning off genes responsible for cancer, infectious diseases, and other illnesses. To deliver RNA-based therapeutics specifically to diseased cells, targeting molecules are incorporated into individual pRNA subunits. These targeting agents include small molecules such as folate, peptides, aptamers, or monoclonal antibodies that insure that pRNA is taken up by diseased cells. Once the nanoparticles enter diseased cells, Dicer enzymes cleave and release the therapeutic RNAs, thereby turning off genes that cause the disease. Both the targeting molecules and gene-silencing agents are tailored to match specific disease tissue. In pRNA hexamers, for example, six positions are available to carry molecules for cell recognition, therapy, and detection. In addition to RNA therapeutics, other materials, including fluorescent beads, radioisotopes, or quantum dots, can be attached to detect cancer at different stages or treat it, according to Davis. The platform has broad potential to combine multiple RNA functions into one nanoparticle, such as receptor antagonism/activation, cell targeting/delivery, and gene knockdown through RNA interference mechanisms. Potential use of phi29 pRNA trimers as polyvalent delivery vectors: Three positions are available to carry specific therapeutic, targeting, and diagnostic payloads. Dr. Guo discovered that the structural and molecular features of phi29 allow it to be easily manipulated to form gene-targeting delivery vehicles. 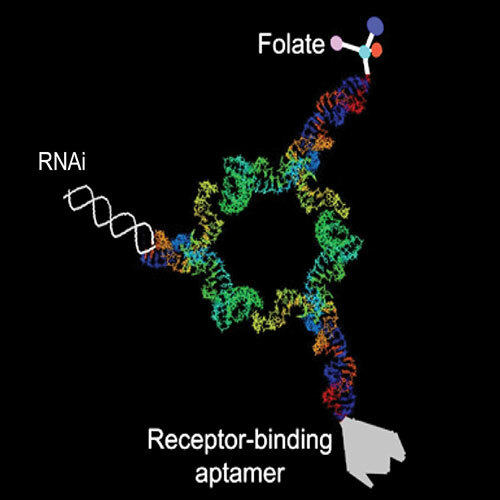 In a study reported in the September 2005 issue of Human Gene Therapy, Dr. Guo and co-workers constructed pRNA dimers containing either a receptor-binding RNA aptamer or folate for cell recognition. The other subunit carried small interfering RNAs, ribozymes, or other chemical groups. The dimers were successfully delivered to specific cells and silenced the genes for green fluorescent protein, luciferase, survivin, and BCL-2 in a variety of cancer cells. The pRNA complexes also could target and treat chronic viral infections such as HIV and hepatitis. In a proof-of-concept study, the pRNA method strongly inhibited replication of coxsackievirus, a common pathogen involved in myocarditis. The most significant challenges in developing RNA-based therapeutics have been delivery, stability, and toxicity. To be successful, small interfering RNAs must be able to penetrate cell membranes, resist degradation by nucleases within cells, move into appropriate cell compartments, and home in on specific cells. The pRNA technology meets all these requirements without causing toxic side effects, Davis reports. Other companies creating RNA-based therapeutics deliver the agents to cells wrapped in liposomes or polymer structures. These formulations are large and complex, and they reportedly hinder the ability of the therapeutics to enter targeted tissues and cells. Additionally, components of the liposomes and polymers may cause toxicity or other unwanted side effects. Kylin initially is focusing on pRNA-based therapeutics to treat cancer, followed by treatments for viral diseases. Among the first oncology targets is the oncogene survivin, which plays a key role in platinum-resistant ovarian cancer. “Survivin is overexpressed in most tumors, but particularly in ovarian cancer,” says Davis. Survivin, an anti-apoptotic gene, is readily targeted with appropriately designed pRNA nanoparticles. By knocking down the survivin gene, apoptosis is restored. Collaborating scientists at Purdue’s Bindley Bioscience Center are helping to test Kylin’s pRNA therapeutics for ovarian and other cancers. Bindley’s researchers are conducting experiments on a number of different targets in animal models with solid tumors. The collaboration “has helped us narrow down our clinical candidates and determine that ovarian cancer is our lead indication,” says Davis.